Advancing human potential is engrained into NEC’s corporate culture. We have a rich and established legacy of contributing to society as a whole. Since the company was founded in 1899, our commitment to innovation has resulted in many socially beneficial firsts aimed at improving the way people live, work and communicate. Creating social worth by helping people to live richer, more fulfilling lives is even clearly conveyed by our company’s principal brand – Orchestrating a brighter world. NEC’s involvement with the International Tennis Federation’s Wheelchair Tennis Master also exemplifies the company’s dedication to advancing human potential. Since this sporting event’s inception in 1994, NEC has been the title sponsor of the Wheelchair Tennis Masters and has worked enthusiastically with organizers, players and supporters to champion the event. 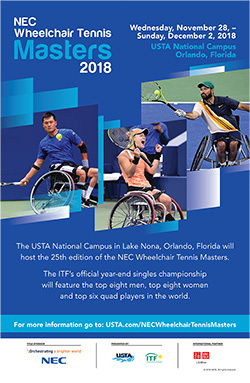 From November 28 through December 2 and for the first time at the USTA National Campus in Lake Nona, Florida, the International Tennis Federation’s season-ending championship for the world’s top singles on the UNIQLO Wheelchair Tennis Tour will take place. The top eight men’s and women’s singles players and the top six quad singles players will compete. Join us in celebrating 25 years championing The NEC Masters and the accomplishments of the event’s gifted athletes. Explore this inspiring sporting event with videos, images, a brief history of NEC involvement and so much more here. Hey Buddy!, I found this information for you: "As Seen on TV: NEC Provides Powerful Crime Solving Face Recognition Software to Law Enforcement". Here is the website link: http://nectoday.com/powerful-crime-solving-face-recognition-software-law-enforcement/. Thank you.